Today’s post is a bit of my short fiction. From time to time, I will post something on that order. 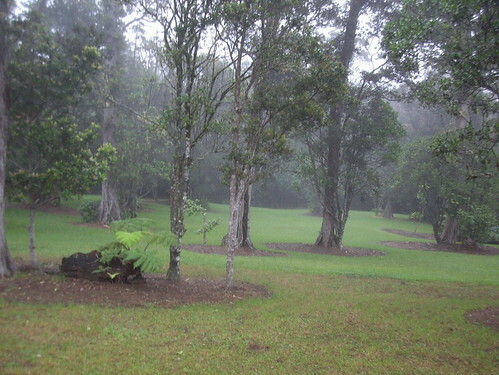 Photo taken at Kalopa State Park, Hawai`i Island. Chores never cease, never subside. Menacing dark corners tower above and below her, dusty and dank. Driven here, thrust there, the woman frantically toils in vain. In every quarter of the luxurious home she unearths wads of shabby rags, inside bureau and closets, beneath tables and beds, over shelves and bookcases. There is no seclusion here. It is no longer her home. Aliens invade, then abandon her in chaos. Serenity is shattered in the assault. In a frenzy, she searches for one spot, one haven of beauty where she may hide from the muck and gloom, sludge and shadow. She is imprisoned and enslaved by the moment, shaken and disenchanted by infinity. Others chart her headway as she labors, then regresses. Despondently she presses onward, now advancing, now reversing in an endless non-dance. Joy pales as the obstacles flourish in neglect. Song is stilled, light fractured, until she spots an overlooked box, unobtrusively tucked away behind the bureau. In dismay, she lifts the lid, supposing it to be filth-filled, or barren at best. A small packet sheathed in foil rests inside, dormant yet dazzling in its obscurity. From the crumpled edge of the opening there protrudes a long green stem, crowned with a large purple chrysanthemum, blossom of her soul. An abundance of petals, long and delicate, unite around a pollen-filled golden center. Tears fall as she recalls the moment she clipped the bloom from its parent. Tenderly she had placed it into nourishing water where it could take root and grow. Now long forgotten, the chrysanthemum has flourished, alone and in the inky obscurity of the ragged box. Surely it was withered and dead by now, for many moons have passed. Other celebrations have come and gone, but the blossom remains. She pauses, then meticulously peels back the foil covering. That which was dormant for so long has burgeoned with fragile and lacy roots. What once was a flower, cut off from its source, has sprouted in the dark, unattended and ignored. Weeping, she holds the hardy segment of beauty in the palm of her hand. The tiny bit of life, buried in the pit of her soul, is resurrected and retrieved. The purple chrysanthemum will never perish. She will survive.